Are you guys hot water extraction or Chem-Dry? Our method is hot water extraction which does NOT void warranties on any carpets. What should I do to prepare for your cleaning? Vacuum all areas to be cleaned. Pick up any items on the floor to clear more areas for cleaning. Move breakables from end tables, low walls, etc. Set your thermostat to 78 degrees to pre-cool the area to help carpets dry faster. Put pets in enclosed areas or secure to prevent them escaping through the door where our hoses will keep the door open 4 inches or more. Can you match coupon I received in the mail? How long does my carpet or tile/grout stay damp after cleaning? Carpets stay damp roughly 8-10 hours depending on air flow from ceiling fans. Any areas cleaned twice due to high traffic or problem spots will stay damp longer. We are always working harder to shorten dry times. We recommend not walking on carpets for at least 2-3 hours initially and offer shoe covers. Tile/grout will dry in 30 minutes. Grout stays damp a few hours but can be walked on right away with clean shoes. Do I have to be there while guys are cleaning? No, someone can let us in or leave a key or garage code and we will measure all areas that need cleaning and give you a price up front before we start. We will take before/after pictures to email you. We will lock up when finished. 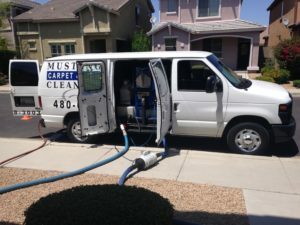 Can you get pet urine out of carpet and tile? It depends on the extent of pet accidents. We will know on initial inspection when we see the floors if they are cleanable. We will recommend replacing floors if it is your best option. For the most part, yes, we can treat basic pet accidents with enzymes/deodorizers. Can you charge half price since rooms are full of furniture? We do measure around furniture when giving estimates. The cost also depends on the condition of the floors and the last time they were professionally cleaned. Do the water and electric have to be on in the house? Yes and Yes! When you steam clean floors with over 200 degrees of hot water, there are always bad odors that need to be circulated out of the house. HVAC fans should be circulating air at a minimum. The cooler the air is in the area, the quicker the carpets will dry. We also need the power to run our high traffic machines to pre-scrub carpets and tile/grout. Water is a necessity so we can hook up to our cleaning system from water source outside to clean. 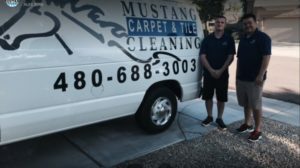 How often do you recommend cleaning my carpets and tile? Carpets manufacturers recommend every 12-18 months to keep your warranty active. If you have a busy household, we recommend cleaning stairs, hallways and family room that get a lot of use every 6 months. Tile/grout can be cleaned every 1.5 years or longer if using correct mopping products. We always educate homeowners with inexpensive over-the-counter products to help maintain all floors and furniture after we clean. 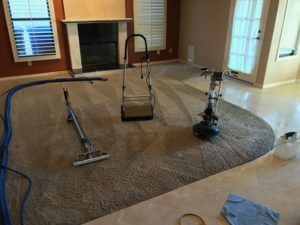 Please vacuum at least twice a week to prevent wear patterns from cutting into main walkways that cannot be reversed (unless new carpet is installed).